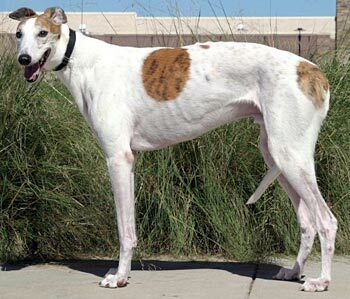 Bingo, aka Bingo Episode, is a handsome, 6½-year-old white and brindle male born April 30, 2002. His sire is Mocan Speed, and his dam is Zest Episode. Bingo was in a home for several years, and returned to the original adoption group, which is now out of business. Bingo is now looking for his forever home, and what a lucky home that will be! 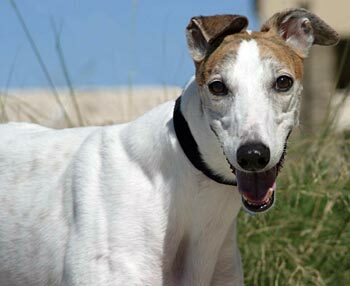 Bingo is a very loving greyhound; he gets along well in his foster home with other greyhounds. Bingo is small animal and cat tolerant. 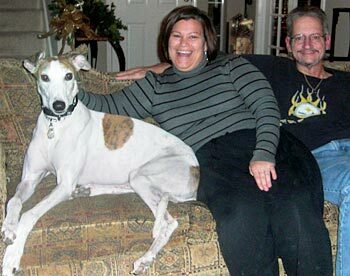 Bingo, now Bowie, with his new forever family.